Kingston gaming division brand Hyper X have something in store for you would be gaming nerds, the new PulseFire Surge RGB gaming mouse have what you probably should expect in a gaming mouse, that's beautiful aesthetics and impeccable hardware specification. 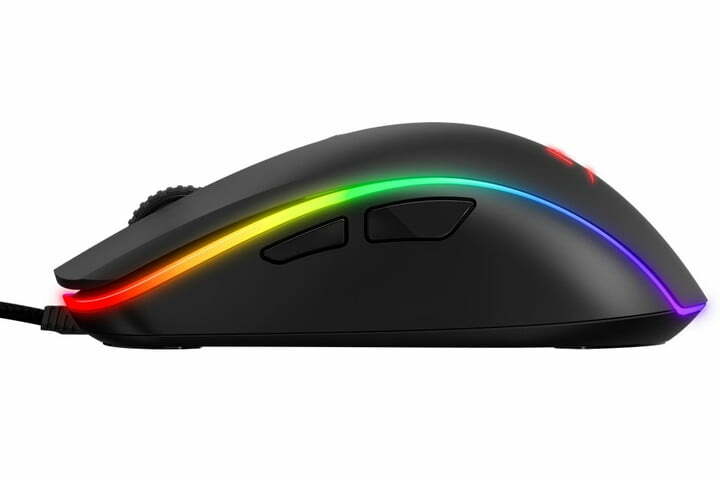 From what I've read on the mouses spec sheet, it seems as though it's definitely a hardware upgrade from the previous generation PulseFire mouse. The measured dimensions of the mouse goes as follows, 120.24 x 40.7 x 62.8mm weighing 130g with the included attached cable. Hyper X implements a technology call a Pixart 3389 sensor, its rated up to 16,000 DPI with a 50G accelerating power. The mouse also uses the Omron switches for the buttons which is rated at 50 million clicks. Its a wired connecting mouse that have a 5.9 ft braided cable which you insert directly into a USB port. There are six programmable buttons on the mouse, left, right, a click wheel, DPI selector, and two left side buttons with added macros, users can adjust up to five DPI settings that the DPI button will cycle through. User's can also adjust sensor performance and configure the RGB lighting on the LED ring, and even the Hyper X logo with up to 16.7 million colors and four brightness levels, all made possible using Hyper X NGenuity software. The actual Surge RGB have a on board memory that allows any users up to three configured profiles that you can actually save on the mouse itself. In comparison to the Hyper X previous gen mouse, the upgrade is noticeable. It adds a much better Pixart sensor 3310 to 3389, more programmable buttons and RGB lighting. The PulseFire Surge RGB gaming mouse surprisingly retail for just $69.99 backed by a 2-year warranty. This gaming peripheral is readily available for purchase at Amazon.com waiting for those credit card digits to be dropped.